Known to his family and friends as “Chappo,” Arnold Riesgo’s life in baseball dates to the 1930s. An outstanding catcher, Chappo started playing baseball with the Tucson Crack Junior Legion Baseballers and starred at Tucson High School (1937-1940), playing basketball as well. He played on the Cowboys city softball championship team in 1937, was awarded a Major “T” in baseball and basketball at THS, played on THS’ state championship baseball team of 1939 and earned a Certificate of Merit from the National Semi-pro Baseball Congress in 1942. 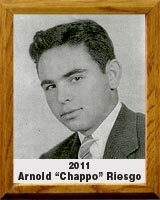 In addition, Chappo played at the University of Arizona in 1940 on the baseball team. Chappo signed a professional baseball contract in Pop McKale’s living room in 1941. After serving in the U.S. Army during World War II, Chappo began a 10-year run in professional baseball. He spent those 10 years as a player and manager in the St. Louis Cardinals and Boston Red Sox minor-league systems. Returning to Tucson, Chappo coached in the Cactus Little League in the 1960s. John Riesgo gave the acceptance speech on behalf of his father.